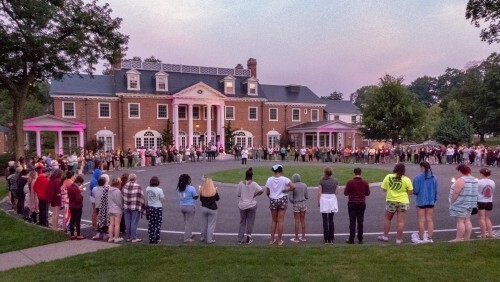 This popular chorus, written by Jimmie Davis and Charles Mitchell, echoes across Bay Path University’s Longmeadow campus every year as the sun rises on the first day of classes for a 23-year-old tradition known as Campus Awakening. Hundreds of University faculty, staff, and students participate in the event. Led by President Carol Leary, Campus Awakening is a candlelit walk across campus early in the morning signifying the start of the fall semester, highlighted by stops at various locations where faculty light torches, symbolizing their role in igniting a passion for learning in students. The tradition began when, in a gesture of fun, a group of students woke the President and campus community to gather and celebrate the morning sunrise. It quickly became a beloved rite on the first official day of classes. Opening remarks by Anne Chapdelaine, the University’s new Dean of Students and Director of Persistence, were given to a larger-than-ever crowd, gathered in front of Blake Student Commons and brimming with excitement. Chapdelaine emphasized the strong sense of community present at Bay Path, and, appropriately, focused on Blake as a hub for some of the most important moments in the students’ college experiences. She emphasized that this event would be only the first of many times the campus community would come together at this location to share in happy moments and make memories. After the procession across campus, participants surrounded Deepwood Circle, where the event ended with closing remarks from Provost Melissa Morriss-Olson, and Student Government Association President Victoria Thomas, before a community breakfast—in Blake Student Commons, of course!